Whenever I found myself getting frustrated about the noise, I reminded myself, “These sounds are like music to those who will wean from a tent to one of these houses.” Yes, if I had been living in a tent for over a year, those sounds would represent an upgrade in my life. Here are two of those precious people who are anxiously awaiting a new place to call home! I will always recall my own lessons in tolerance when I look at this painting that evolved while under the influence of the sounds of construction. The painting is one of six that have a great future temporary home in nearby Jama. More on that soon! Lots to share and not so much internet time! 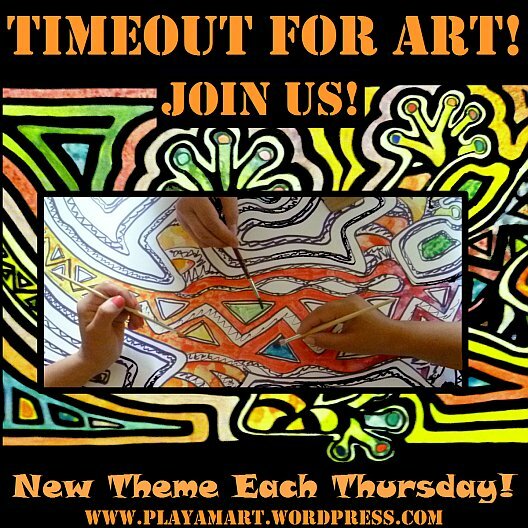 Remember to take a timeout for art! I am having a big construction right next to my house too. So I understand how challenging it can be at times. But most of all in your case it is wonderful to know what this is for! so sorry that I missed this and many other comments! I hope that the construction near your home is now finished.. it’s hard to find harmony when there’s chaos altering the rhythms of the area.. maybe that’s why the willow tree broke/split a few limbs? The stopped blasting in order to loosen the ground but until the house is done it will be July 2018… lol! They just started with everything. They just put up a huge tower crane right next to our house! Here in the earthquake area, the sounds go day and night – not so bad now at night, but there is…. never.. silence… It makes me realize how important silence is to me, and that when I have that type of environment, to treasure it even more! Oh yes, they are for sure. That’s the son of one of the neighbors we know for 16 years now and they build their house right next to them. All nice people! Since it happened that have to work much more lately I did not have any inconvenience anyway… lol! The benefits will far outweigh the next year’s challenges, and you’ll all enjoy the newcomers in your neighborhood. Beautiful painting Lisa.. and yes noise can be a distraction.. But knowing what that noise is for makes it more tolerable.. Living in tents is no joke. And a year on is a long time.. I wonder at times how these people cope and still smile.. Such is the beauty of the hearts of these people.. Which make it all the sadder that its often those with the least that have the most taken from them..
hi, and so sorry that i did not reply to this comment. i’ll blame the concrete mixers and the ground’shaking machinery? earlier in the week i visited with a lady who lived for a while in the tents.. she said that during the rainy season, the rats would burrow under the tents/beneath the floor…. one night a rat bit her arm! that brings it so close t home.. having to endure that – and not having ‘asked’ for that misery, but they coped the best they could..
the tent cities are becoming smaller, and people are beginning to settle in the little monopoly-looking houses. shade trees would be very helpful, but there’s nothing but lastre – not sure what would grow in what’s basically crushed rock…..
am still resting and nursing a not-so-common headache…. at least i’m catching up on missed comments! Lisa, I’m laughing so hard you ought to be able to hear me. For the first time since I’ve been seeing your “hands,” I saw it in a new way tonight. If you flip the image vertically, it looks just like one of the milk-filled rubber gloves that still are used in pre-schools and day cares to teach kids about milking cows. As a matter of fact, I remember that being part of my second-grade experience. After learning the process with our fake udder, we went to a farm, milked cows, and then “churned” butter by shaking it in Mason jars. One thing’s for sure: your art is as nourishing as the milk from the village cow! I’m just now getting back to this comment that went a little awol thanks to wp notification saying there were no more comments… and i knew there were more! today i’m able to scroll backwards in time, but most days, no.. perhaps its the slow internet? anyway, no, as i stated somewhere, i was never educated about milking cows with a faux milking glove and don’t remember seeing one! how great that you were able to churn butter and see the results instantly! friends had milk cows and fresh butter, etc, and that was always done ‘behind the scenes’ so i did not participate.. it always seemed weird to see the just-scalded milk on the stove.. and then the top skimmed away.. and then we were to drink milk that clung to the sides of the glasses.. politely i drank the milk, but privately i did not enjoy the experience. my, how i’ve grown since! So great to see the construction – glad to know some of the residents will have a solid structure over their heads once again. It’s a beautiful thing. I’m so sorry to be this late in replying to this comment…. the tent cities are becming smaller, as people wean to new housing… there’s still a long way before the area is normal – it truly looks like a ‘third world country.’ thankfully many now have petite little casitas.. next? shade trees would be very helpful! Construction noises. I imagine they are music to their ears. The progress on your painting is so cool! How did you do that? Consider that hand ‘salute’ reciprocated! Oh Lisa, I know those bunker looking things will be a great relief to those lucky enough to upgrade from tents. But they look so….communistic? I am imagining them after you’ve worked your magic with the residents to turn those blank walls into colorful feasts for the eyes. Who is funding the building project? Bunker looking is so true, and no shade, and there was a lot of gravel/lastre hauled in before they built, so no hopes of little gardens or trees to support hammocks in the future.. yes, i’m tempted to go out under the full moon and leave some happy art on those walls! You’re at it again Lisa – gifting the world with art. I love it. I wish your internet connection was better. More lessons in patience. I’m so glad those houses are going up though. Do I detect the influence of molas in the later stages of your hand design? Ha.. yes, and the ‘Mola Series’ is well received and works well for involving others — ‘here, take the brush and paint for just a few minutes…’ and they continue painting..
We went into an art gallery in Oklahoma City a few weeks ago and noticed one framed mola. The guy on duty didn’t know what it was, so I told him. That reminded me that I used to have a mola from my time in Central America. I don’t know where it is now, perhaps packed away in a drawer or container with other old things. The houses look sturdy and solid, but, yes, they may need a little artistic softening at some stage. Fingers crossed the construction will be finished soon and people can start turning the houses into homes. You would definitely be one to see the houses’ true worth and ability to withstand another large quake. The community still grows, with workers doing quieter tasks inside the houses at night, and presently at 8 the day sounds are cranking and building.. I look forward to seeing it – perhaps in a few weeks… Of course there will be pics! still loud and at times challenging here, but compared to those who have few options, it’s attitude that gets us through… thanks!